Custom Window Treatments, Cornice Boards, Headboards, and Valances! 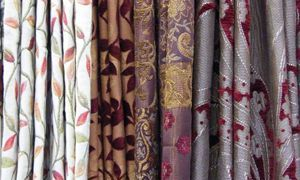 Sandie's Stitchery is a wholesale drapery workroom specializing in cornice boards, headboards, and top treatments. We offer a full line of custom window treatments including draperies, shades, pillows, table cloths, dust ruffles, and more. We pride ourselves on delivering excellent customer service and top quality workmanship!